Going by the signature and date of 1923, this unpublished female bronze head by Francesco Messina might be identi ed with the work he exhibited at the 14th Venice Biennale in 1924 under the title of Vittoria . A similar version in bronze with a vibrant chased finish has also been mentioned by Eliana Principi, who thinks this was the piece presented at the Biennale. 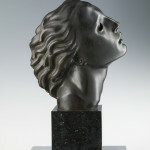 Though the issue cannot for the moment be decided in favour of one or the other, it should be noted that our bronze has a surface treatment which perfectly matches well-known Messina works of the period, like the Cristo morto, shown at the 1922 Biennale, or the Autoritratto of 1924; by contrast the chasing on the version presented by Principi is altogether uncommon. The subject ties up with the 1923 competition for the Monument to the Fallen at Genoa, in which Messina and his colleagues Guido Galletti and Edoardo De Albertis took part along with the architect Giuseppe Mazzoni. The classic topos of Victory had been a favourite in monuments commemorating Great War victims; here it is condensed into a head thrust backwards. 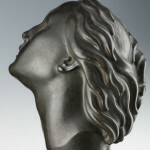 The sensual, almost melancholy face with its slightly parted lips and deep-set eyes is still completely under the in uence of Wildt, in keeping with the stylistic bent of the youthful Messina: until the mid-1920s his secessionist leanings were slow to fade before a growing taste for ‘verism’. 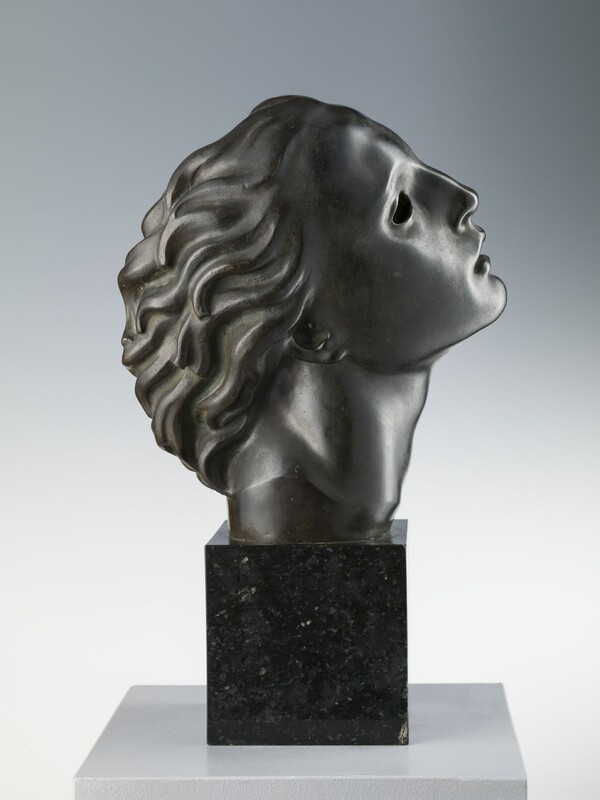 This Victory has similarities with bronzes like Ophelia (1923) and the Dead Christ (1922) shown at the 14th Biennale. His monumental marble Resurrected Christ for the Chapel of Intercession at Staglieno Cemetery, carved after he won the national contest promoted by Genoa Municipality in 1922, is a fine example of Messina’s idiom at the time. The tilted-back position of Christ’s head recalls the present Victory. 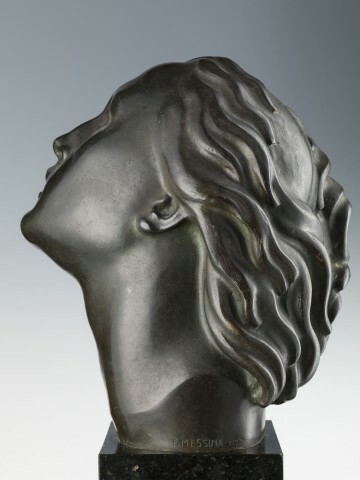 But the sculptor’s style would change after his personal encounter with Arturo Martini at the First Exhibition of Italian Novecento, Milan 1926, where the Victory was once again on display. Recalling his impression of Martini many years on, Messina would say: “the meeting was electrifying and a friendship was kindled, especially on my part”. 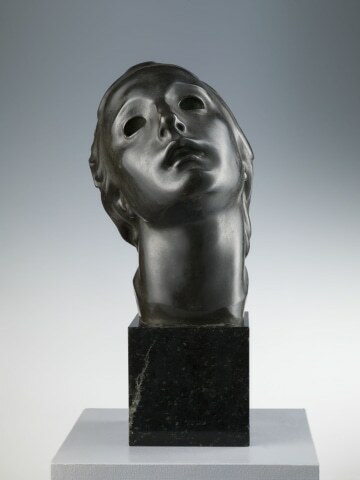 Thereafter – as the sculpture Lovers (1928) would show – Messina’s modelling swung towards the dictates of Margherita Sarfatti, the prime instigator of the Novecento movement: “clarity of form and neatness of conception, nothing over-distilled or eccentric, progressive elimination of all that is arbitrary and obscure”. 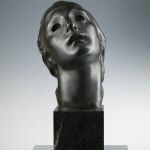 For example, there seems to be a certain archaic quality about the unpublished bronze Male head (signed but not dated), suggesting a highly personal revisiting of the face of Saint Sebastian by Antonello da Messina. "It was Vittorio Guerriero, Montale’s schoolmate and companion in arms, who introduced us. There developed a warm fraternal friendship. Eagerly and constantly seeking any voice that might enrich my spirit, I greeted this acquaintance with Montale as a piercing light of puri cation. He uncovered my ignorance, my poverty and my thirst for genuine art... He spent his days in the town libraries and we would meet in the late afternoons when he came out for air, our haunt being the Galleria Mazzini. Gradually Guerriero receded from my new eld of need which Montale fostered with humane friend- ship, recommending books to read, but above all setting a crystalline example. For me it was the start of a new life”. 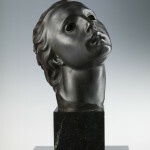 A fresh start entailing even harder labours and assiduous participation in exhibitions at home and abroad – such as the Exhibition of Contemporary Italian Painters and Sculptors held at the Zurich Kunsthaus –, crowned in 1942 by his first major recognition: the sculpture award at the Venice Biennale". 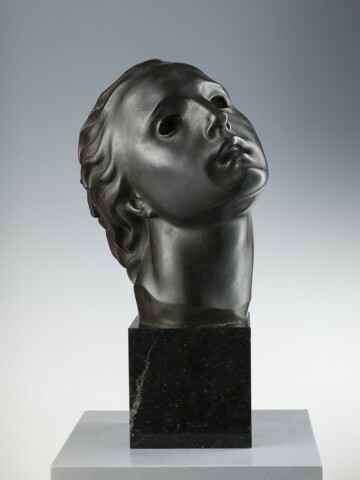 Our Vittoria thus stands as a key work in understanding Messina’s youthful output which would later fall a victim to the sculptor’s own destructive fury when he looked back at his work of the period: “Fever devoured me. I would return to Genoa [after travelling abroad] in a storm of emotion, and wield the club, smashing the fruit of years of toil”. In a 1974 interview Messina would confirm: "My output between 1915 and 1928: all destroyed. There may be one exemplar, the Group of lovers, which survived because my friend de Pisis swapped one of his pictures for it".